The HP Slate 500 - it's back! The Hewlett Packard slate PC has been listed on the company's website, with the company also applying to trademark the term "PalmPad" – fuelling speculation about the company's plans to introduce what many were referring to earlier this year as a potential 'iPad killer' tablet PC. The latest details on the HP Slate, from a listing on the HP website, claims that it will feature an 8.9-inch screen, two cameras and run on Windows 7. Win 7 or Palm WebOS? HP, the world's largest PC maker, originally announced its plans to release the HP Slate running on Windows 7 OS earlier in 2010. 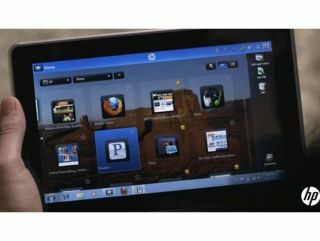 Since that time, HP has acquired Palm, and is looking to develop Palm's WebOS mobile operating system for a range of new devices, including tablet PCs. HP has listed the one model of the HP Slate 500 on its website. The device includes an 8.9-inch touchscreen and runs on Windows 7 Premium. The device also has two cameras -- one video and one still -- for users to do "web conferencing," according to the listing. "No matter where you are or what kind of fun you're in the mood for, the HP Slate 500 is all you need. Exclusive HP software gives you access to photos, videos and everything on the Internet with just a touch, while Windows 7 Premium gives you the power to do what you want. "The unique design and 22.6 cm (8.9") screen put the full Internet in your hands, while two cameras (video and still) let you capture life as it happens or participate in web conferencing. Adjust the screen orientation to fit your content and use the pen to write or draw as if on a piece of paper. Whatever you want to do, the HP Slate 500 helps you do it – and makes it more fun too." You can see the HP Slate listed in multiple models on this page from HP's website archived on Google. TechRadar has contacted HP's UK office for further comment.